Prepared in 25 minutes or less plus overnight refrigeration. Mix all Ingredients well – cover and leave in refrigerator overnight or at room temperature for a few hours. In order to prevent the mix from falling off the skewers, you should drain the water (juice) out of the grated onion before adding it to the meat. Also the colder the mix, the better it will stick to the skewers. Dividing the meat into 10-12 portions. 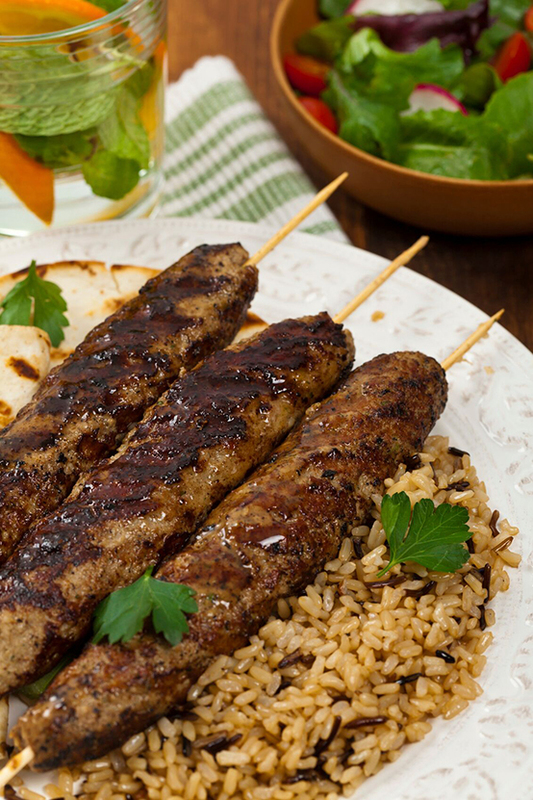 Press each portion around long metal skewers and shape evenly. Place the skewers a few inches away from the grill coals. Turn constantly for a couple of minutes and then cook each side for a few minutes. Serve with fresh lemon wedges and a bottle of Greece’s finest reds from the Peloponnese. Oo-pah! Serves 4.